OVIEDO | For the past eight years, a week before Palm Sunday, Jim Riley takes a small group out into the woods located on the Most Precious Blood Parish campus in Oviedo. He and his crew gather about two dozen palm fronds. Although the palms distributed to parishioners are ordered through a company in advance, these are full palm fronds used in the opening procession of the Mass, recalling Jesus’ arrival into Jerusalem on Palm Sunday. 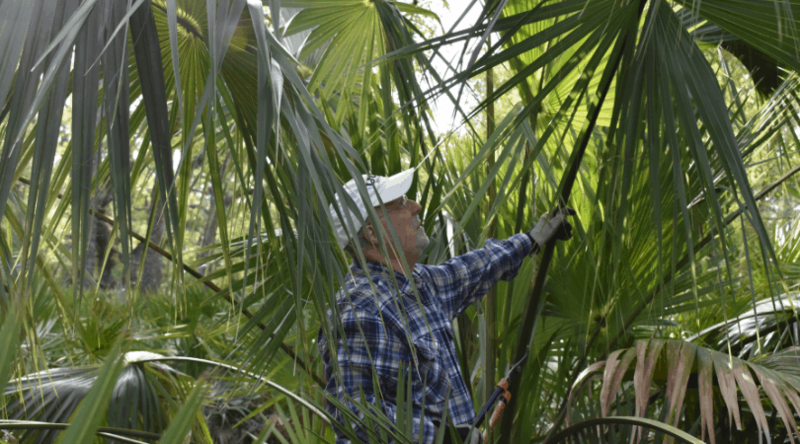 Meeting early on a Saturday, Riley, Dung Trang, and Kevin Monteleone brave the palmettos and brush that hug the edge of the parish property and select the best-looking fronds. Size, shape and overall beauty dictate selection. Then their wives: Gloria, Chris and Le, (respectively) remove any sharp spines, wash them and put them out to dry. “We don’t want any bugs to drop on people while they’re processing, sending them running around screaming,” he laughs. Afterward, palm fronds are sorted by size so children and adults participating in the liturgy, from lectors to altar servers and greeters, may select the one they will carry into the church. “I like the community spirit,” says Chris. She has done this for the past six years and looks forward to the event. Gloria appreciates the camaraderie as well as the first year it was just she and Jim doing it all. “I love processing into the church. It’s so pretty and it makes you think of the first Palm Sunday with everybody coming with palms,” she noted. This year, new ECO Wellness coordinator, Elaine Fisher, joined the team. She hopes to carry on the tradition.